When you start driving you will see three types of speed sign: a public regulatory limit, a private regulatory limit and a suggested safe (advisory) speed. Public regulatory limits always end in zero. They start at 10km/h (which is rare and usually for shared zones where pedestrians and vehicles share the same space). The next step up is 20km/h at places like accident sites and when overtaking a stationary school bus. You might see 30km/h in some shared zones and road works, 40km/h around schools, 50km/h for regular urban areas, 60km/h and 70km/h for some urban thoroughfares and dual carriageways, 80-100km/h for the open road, dual carriageways and motorways, with 110km/h permitted on some stretches of road. The speed limit is a maximum speed, i.e. you should not exceed the posted speed limit. Speed limit changes are sometimes warned in advance to give drivers time to slow down. This is common when coming up to roadworks, or where the speed limit sign might not be that visible if the weather is bad or the road direction and relief is irregular. Speed limits due to roadworks will have a ‘temporary’ plate underneath. Private regulatory limits are set on private land by the land owner. They are usually low, for example between 5-20km/h. They are often found in retirement villages, universities, schools, large industrial complexes, and areas where there are likely to be either heavy pedestrian traffic, or large slow vehicles manoeuvring. They can be formatted the same as the public speed limit signs or can be in designs custom to the property owner. Suggested speeds are found ending in 5, and they start at 15km/h. They are almost always for cornering and are either in a yellow rectangle or attached to chevrons such as on the left here. 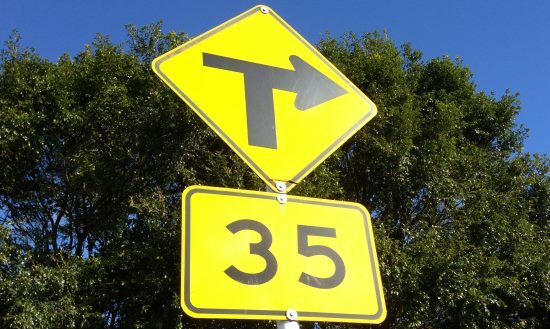 For example, as you approach a sharp right-hand bend it might be signposted 35km/h as in the photo below. Drive the other way and it becomes a left-hand bend and might be signposted 25 or 35km/h (depending on the angle, camber and visibility). This suggests a comfortable speed in dry weather. As a learner driver, it’s advised to stick to these speeds until you understand whether your vehicle is capable of more, you have better judgement, and you know that particular road. If it is wet, exercise more caution, particularly if you see signs such as ‘Slippery when wet’ on the approach to the corner. Advisory speed limits are set by testing the g-forces required to get around the corner. The speed on the sign is the closest to when the g-force is 0.22g. Because suggested speeds and regulatory speeds are always written differently, there’s no chance of confusing them. Even though many corners have suggested speeds, 78% of truck rollovers happen at corners with advisory speeds displayed.